Hi! I’m Natalie from A Turtle’s Life for Me, and I’ve been so looking forward to hanging out with you during Kelly’s 12 Days of Christmas Series! My blog (and life) is all about creating things that are fairly simple but have a big impact! 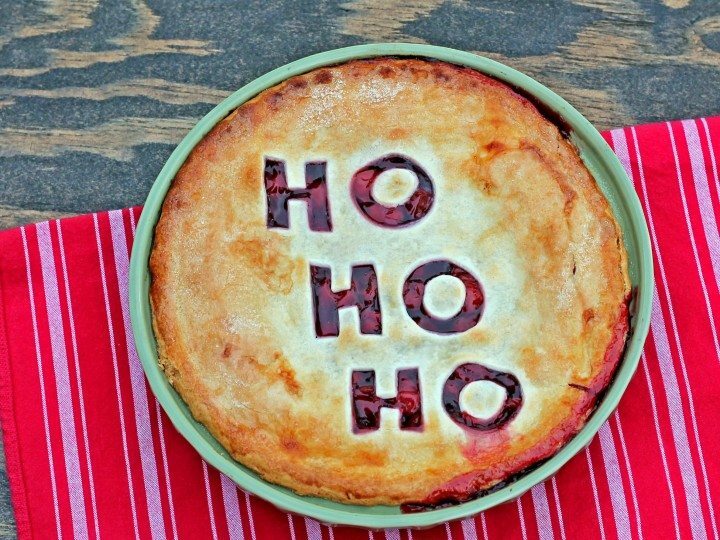 This Christmas Cherry Pie can be as hard or as easy as you choose, but either way it is sure to impress and will look fantastic on your holiday dessert table! Or package it up as a neighbor gift instead of the standard cookie platter. Hint: if you also take some vanilla ice cream with it, you will earn the title of Favorite Neighbor Ever!! 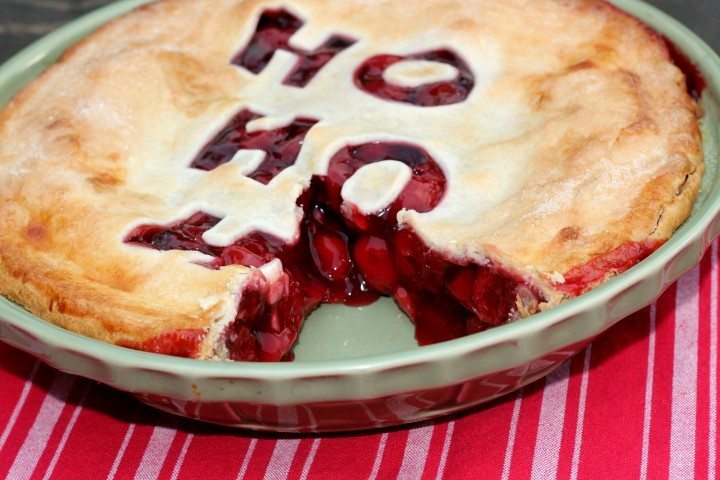 Because we have enough stress during the holiday season, I went the simple route with my pie and used pre-made pie crust and 2 cans of cherry pie filling. Let your pie crust thaw at room temperature for about 15 minutes and then unroll onto a cutting board. I used 1.5″ cookie cutters to cut out my letters, but feel free to use whatever you have! Get creative! 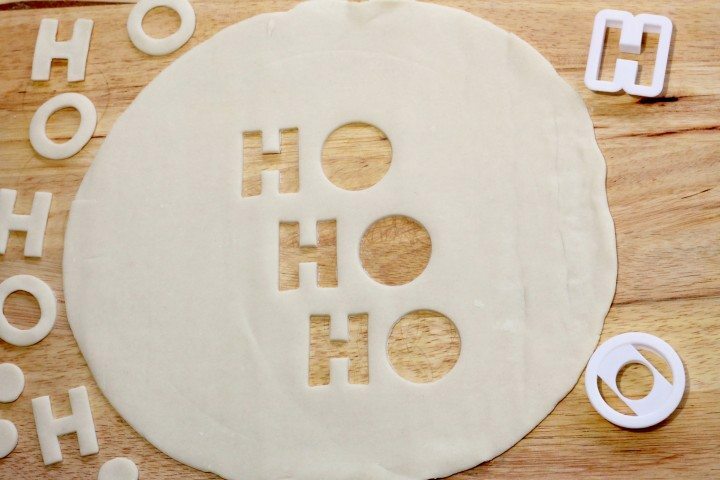 Spell out “Merry” a family joke or just use a Christmas tree cookie cutter to cut out shapes! The only thing I altered from the directions on my can of pie filling, was to brush the top crust with a beaten egg white. Then I sprinkled about 1 tbsp. 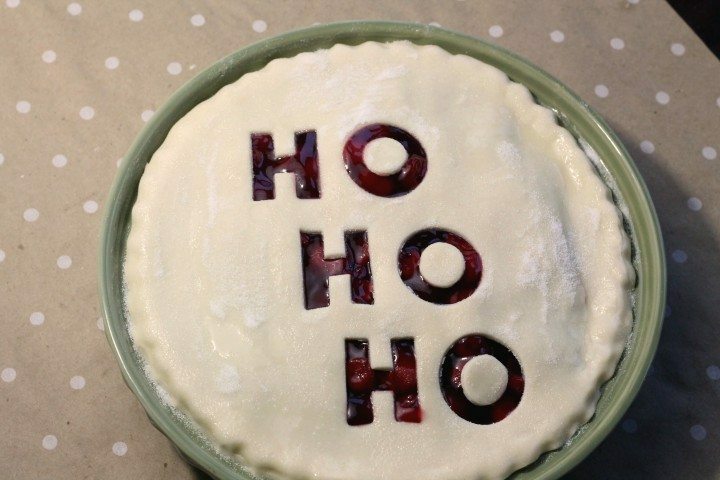 of white sugar over the top crust before baking it to give it a little extra sparkle, because it’s Christmas!! And if you have the time and inclination to make everything from scratch, well then drop it off at my house because it sure will be enjoyed! or this wooden photo board that I made last year for my sister-in-law in our homemade gift exchange! I’d love to have you follow along on Pinterest, Twitter, Instagram and Facebook too!